Click here for a video collage of TV appearances AND Jimi Handtrix clips. February, 2018 The Four Squeezins were featured on NBC, CBS, WMMR & WIP in Philly with their Eagles Fight Song and my very own parody of the Brady Bunch entitled "The Brady Crunch". GO BIRDS! March 30, 2015 The Four Squeezins made their 2nd appearance on "America's Got Talent". 2011 - 2014 Comfortably Retired with the exception of church fundraisers. Serenity Now! July 16, 2011 The Three Tendons were featured on FOX TV's Saturday midnight rerun of "30 Seconds to Fame". 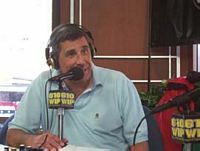 June 8/9, 2010 WIP 610 Radio - Sports Talk with Angelo Cataldi. Performed "Final Jeopardy" on tire pump & hands in the studio and won 2 Luxury Suite tickets to Game 6 of the Stanley Cup Finals. Encore for the show was "God Bless America" on hands. April 25, 2010 The Four Squeezins were featured on "Don Polec's World" special to air regionally in the USA. Musical Depreciation Society's weekly national radio show between Dr. Elmo & Little Richard. Musical Depreciation Society's weekly national radio show right after Weird Al's "Frank's 2000" TV". Oct. 7, 2007 The Four Squeezins were featured on CW's "Online Nation"
Summer, 2007 CH SAT.1 in Hamburg, Germany. Features Jimi Handtrix's Star Spangled Banner on Tire Pump. Summer, 2007 "Totally Viral" on UKTV-G2 in London, England. Features several Four Squeezins' videos. July 24, 2007 The Four Squeezins will be LIVE on The Preston & Steve Show on Philly's 93.3 WMMR after 8am. June 26 & 30, 2007 NBC's "America's Got Talent" with the PA Hand Band. April 17 - May 28, 2007 Jimi Handtrix on Comcast ON DEMAND TV, keywords Jimi Handtrix/Cutting Edge/Ziddio in Aspen. March 1-2, 2007 Jimi Handtrix taped "Accidentally Famous" at HBO's Annual Comedy Festival in Aspen, CO.
November 27, 2006 The Four Squeezins appear on WMMR's "Preston & Steve Show". November 24, 2006 The Four Squeezins appear on CN8's "Your Morning". August 24, 2005 FOX 29's "Good Day Philadelphia", "Andy Griffith", "Green Acres", "The Entertainer". Aired nationally via WGN-Chicago: ABC's "America's Funniest Videos" "Pumped up for Final Jeopardy" Finalist, RERUNS RULE! 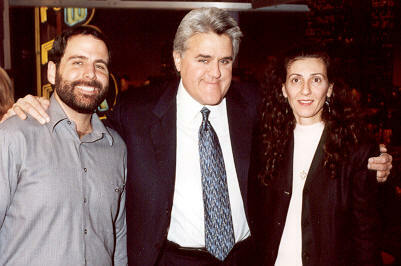 (Original Air Date 2/7/03). Thanx Dave in CA! Dec. 21, 2003 ABC's "America's Funniest Videos", 7pm "Pumped up for Final Jeopardy" 3rd Place Finalist, RERUN...(Original Air Date 2/7/03). August 10, 2003 "Over the Rainbow", from the "2 Hands and a Tire Pump" CD is featured on Kid's Corner (WXPN-FM 88.5) in a playlist along side Kermit the Frog's "Rainbow Connection" and Judy Garland's version from "The Wizard of Oz". April 18, 2003 ABC's "America's Funniest Videos", 8pm "Pumped up for Final Jeopardy" 3rd Place Finalist, RERUN...(Original Air Date 2/7/03). Ongoing...EVERY Friday @ 6:57am featured in a commercial for NBC-10 Philadelphia (pending Iraqi War coverage) right before the "Today Show". NBC-10's "10!" @ 10am live in Philadelphia with Bill Henley promoting the CD "Two Hands & a Tire Pump". Dec. 20, 2002 Kid's Corner on WXPN-FM 88.5 Philadelphia, 7pm with Kathy O'Connell live in studio. 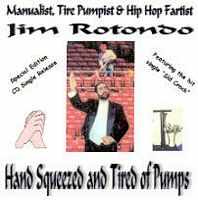 The first airplay of "Hand Squeezed & Tired of Pumps" is granted by DJ Otto Bost of WDIY-FM Allentown, PA. The track was "The Entertainer". April 1, 2002 "Acoustic Eclectic" on NPR 93.9 WDIY-FM Allentown, PA with the "Folk Dude" Otto Bost. April 16, 2001 WIP-610 Sports Talk w/ Angelo Cataldi, w/ "The Three Tendons"
Re-airing of Don Polec's World, ABC News, w/ "The Three Tendons"
Don Polec's World, ABC News, w/ "The Three Tendons"
The "Tonight Show w/ Jay Leno" w/ "The Three Tendons"
"Angelo Live" on Comcast Sports Net w/ "The Three Tendons", Super Fan and incognito in my basketball head for "Sweet Geogia Brown". FOX 29's "Good Day Philadelphia", a Dickens Christmas. FOX 29's "Good Day Philadelphia", "Organic Gardening"' (Nominated for a Daytime Emmy). April 15, 1999 FOX 29's "Good Day Philadelphia", "Yellow Rose of Taxes". ABC's "Philly After Midnight" w/ Wally Kennedy. FOX's "Donny & Marie Show" w/ Smokey Robinson. FOX 29's "Good Day Philadelphia" w/ Frankie "Double Dutch Bus" Smith. FOX 29's "Good Day Philadelphia", 1st of 6 appearances with comedian Grover Silcox. WB's "Real TV" w/ John Daly. Currently (2003) TNN airs Real TV reruns 3 hours per day. Dec. 22, 1997 NBC News w/ Siani Lee. May, 1989 "The Mondo Variety Show" w/ Jeff Martyr on LA syndicated cable. CBS's return of "The Gong Show". Earlier online education was not known to all. Kaplan University saw to it that all are aware of such opportunities. Now the DeVry University as well as the Walden University will be coming up with more options. The Capella University is already on its way to introducing a new line. and can't see the LINKS frame to the LEFT, CLICK HERE. The Official Site should look like the picture above.